How many more games can they squeeze out of the Cthulhu Mythos? Lovecraft permeates everything, from plushes to silly card games to dark roleplaying games. When Mountains of Madness came out, I wondered if this was just one more game to play once and then move on. Great or not, it would sit on my shelf next to Arkham Horror, The Stars Are Right, and Cthulhu Dice. I can now say, with high confidence, this game will regularly be played. 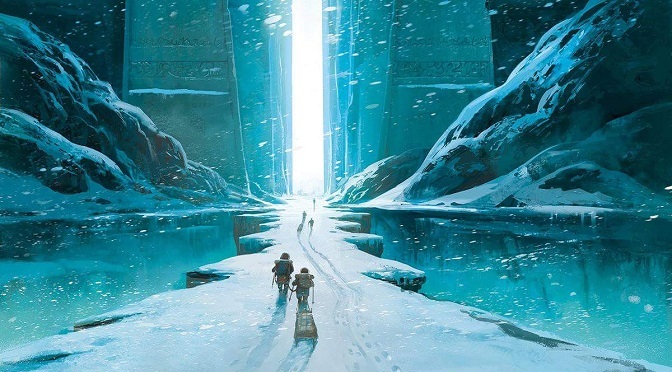 Based on the novella, Mountains of Madness is a co-op game where your group is on a 1930’s expedition into mysterious ruins found in the mountains of Antarctica. Your team will explore deep into the frozen continent in their search for mythical artifacts and arcane knowledge. Unfortunately, the further you travel, the harder your journey and the more likely you will lose precious supplies, face injury, or lose hope. Even worse, as you travel onward, madness begins to overtake your team increasing the probability you’ll never make it off the mountain alive. Will you survive your journey to the heart of the mountain? Even if you escape, was the journey worth everything you lost? Despite its parts and in-depth setup, Mountains of Madness is a rather simple game. Random tiles are placed in locations you can explore, from the Antarctic coast through the mountains and into the mysterious ruins of an ancient city. Each round the leader moves the plane to an adjacent marker where they discover what they need to overcome and any rewards they’ll receive. The real fun occurs during this Encounter Phase, as the group only has 30 seconds to communicate and play Equipment cards from their hand to meet the requirements of the location. Don’t play the right cards or finish in time, and your failure may cost you; win any of the Challenges, and you’ll be granted an object or bonus. This communication is made more complicated as team members go mad, represented by a Madness card that instructs the player to behave in a certain way during those precious 30 seconds. Perhaps they must hold their cards over their head, can only talk if someone is looking directly at them, or must refer to numbers by their corresponding calendar month. You certainly can gain Madness as a possible consequence of failed Challenges, but you’re more likely to go insane as you find the very ruins, specimens, and ancient knowledge that are your purpose. This process means the further you reach your goal, the more your insanity will make you likely to fail at your aims. Mountains of Madness has other aspects that add difficulty and require strategy. Location tiles initially have a range of numbers to reach (such as 7-9 Crate-type cards); the further in, though, you’ll find they require specific or hard to reach numbers. As you can guess, coordinating people acting strangely into hitting a precise 14 Weapon-type cards is highly tricky. Equipment decks can be filled with cards from the Injury deck, which take up precious hand space and affect the outcome. Also, Equipment to use during encounters is limited, only reshuffled by the Leader with a hefty cost. Leadership changes each round, placing the fate of the group in the hands of one person’s decisions. The leader can undoubtedly discuss matters with their team, barring the limits of the Encounter Phase, but they are ultimately responsible for movement and other choices. Leaders also have access to a limited supply of Leadership tokens that can be used in a variety of ways. Careful, however, as these tokens enter a discard pile that can only be refreshed through specific paths; the tokens can even be removed from the game permanently, putting the group at risk. Mountains of Madness is very stereotypical as a Cthulhu game, as there are many ways to lose and even winning occurs on a spectrum. Run out of Leadership tokens and the team loses all hope and is lost forever. Empty the Injury deck, and the group succumbs to their wounds and the harsh environment. Even if you escape the mountain, if you have more Injury cards than Relics, the expedition is considered a failure. Only by staving off wounds and madness while gathering as many artifacts and knowledge as you can, will you garner some measure of success. What I appreciate about Mountains of Madness is how many routes you can take toward victory. Your team can choose to push forward directly into the mountain, hoping to bypass the Challenges and reach the heart before madness and injury take their toll. Unfortunately, you may end up with very few Relics, and the trip will still be a marginal success (at best). Alternately, your group may choose to explore each area carefully, discovering many an artifact or piece of information. The longer you take, however, the more likely you are to gain injuries, suffer madness, and make your journey to the heart (and escape) even more difficult. The downside of this game is the minimum requirement of 3-players, which means you must have a group. As a working parent, I’ve repeatedly emphasized how much I appreciate solo and two-player modes; scheduling a group of three or more people is an obstacle for many of us. Also, while the Madness cards are fun, don’t expect anything informed or respectful regarding mental illness. Most of the effects are particular OCD-type symptoms rather than real insanity; that’s for the best, though, as forcing gamers to play real disorders would probably be disrespectful. One more area that can influence gameplay is how well the group knows each other and works together. A player who takes charge and communicates expectations before the Encounter can lead a team to victory far more reliably than less cohesive groups. Despite these flaws, Mountains of Madness has become a favorite because of its mix of co-op strategy and party game antics. I also love that a session can often be done in around an hour or so, unlike so many other Lovecraftian games. Rob Daviau and IELLO’s game works well for many levels of gamers, regardless of whether they love the Cthulhu Mythos or not. I’ve found Mountains far more a staple than the simple or complex games already saturating that theme. Mountains of Madness is on shelves now. 3-5 players, 60-90 minutes, Ages 12+. I give Mountains of Madness a reality-shattering 4 specimens out of 5. Reblogged this on Loading Snacks.